Get certified as a Proficient Project Manager (PPM) Online! 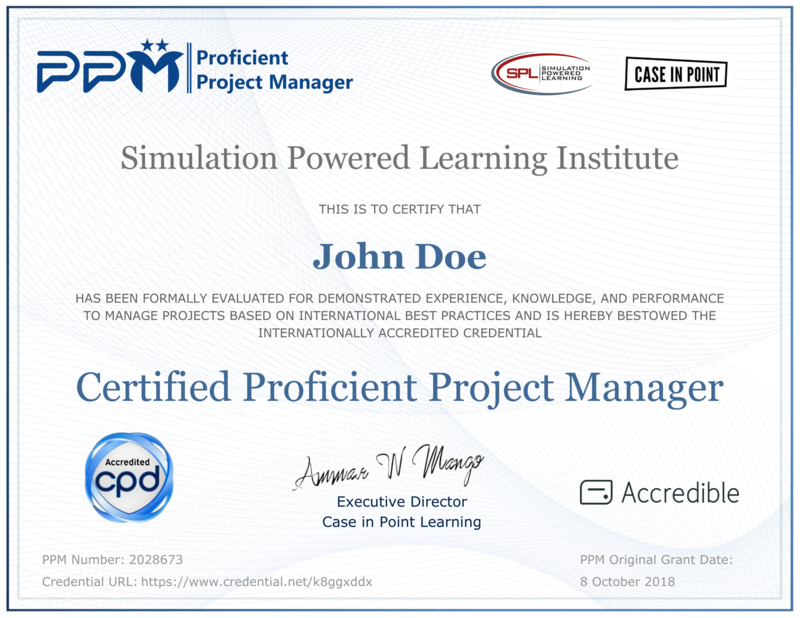 Certificate by Simulation Powered Learning – USA. A Charter Global Registered Education Provider. Winner of Best-of-the-Best Award by PMI. Internationally accredited by CPD Standards – UK. Recognized by the CPD Institute as the UK’s most prestigious, and a leading, global provider of CPD accreditation. 100% Online, all at one place. Interactive course: offers a discussions platform where the instructor will be available to mentor you and answer your questions throughout your course. 3 months money-back guarantee, no questions asked. Watch, listen, and learn practical knowledge you need to lead. International Consultant and coach, with 25+ years of experience that includes coaching thousands of individuals and consulting for Fortune 100 companies, including Fermi II Nuclear Plan, Visteon, Ford Electronics Division, Ford Motor, American Airlines (Cargo), among others. Listed Draft reviewer of most version of the PMBOK, Standard for Program Management, and Standard for Portfolio Management. Participated in preparing exam questions for the PMP exam. Was selected multiple times by PMI to offer exam preparation courses in the US to PMP candidates. PMI Member since 1991 and PMI Jordan Chapter Founder. Delivered over a hundred courses on Organizational Project Management Subjects globally. Delivered over fifty speaking engagements, workshops, and seminars as guest speaker including non-profit organizations, governmental, and international entities. Guest Speaker and Panel Discussion Leader at PMI 2014 Global Symposium. PAC Award of Distinction and PAC Project Leader of the Year Award. Speaker at PMI 1993 Congress and Symposium, Pittsburgh. MS Construction Engineering and Management, University of Michigan, Ann Arbor. very excellent course I completed this course, spending 5 hours a week on it and I read the PMBOK ® Guide many times . It was excellent , solid course. The material is presented very well, and is really teach you how to be a professional project manager without need to unimportant information or details you will not use it ever in your real project . thanks a lot for your effort . My Revesion to Course Ammar Manago is the best teacher for me, I knew him since 2003, He was leader in introducing PMP in yhe region. We are on all your favorite social networks. Come say hello! We’re here to answer any questions you have about the courses we offer. Download my FREE e-book "Management Made Easy". When I look back at thirty years or so of consulting, everything is a lesson learned. I feel it is time to put a selected group of my articles in a book that focuses on the human aspect of Project Management. "Ammar's knowledge of project management was directly responsible for Ford car program deliveries on time and under budget. His ability to work with worldwide team members created cross functional teams not frequently found at Ford".